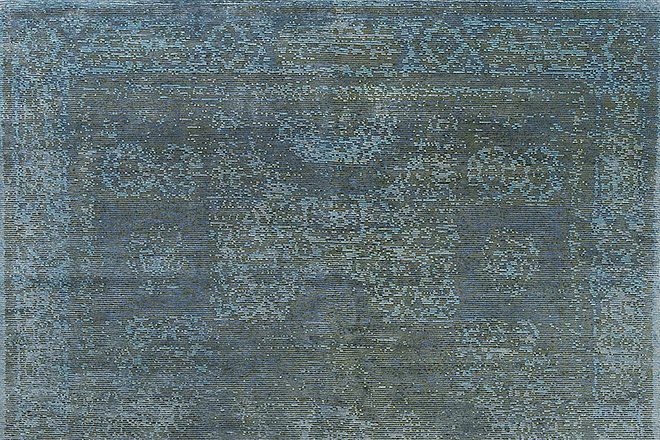 As rug of the Month in January 2016, we present a brand new design from our very popular Tibey Collection. Characteristic for this collection is the special loop and cut knotting technique: The rugs are knotted alternately in woolen and silk lines, but only the silk lines are cut, while the woolen lines stay closed (loop). The exclusive material combination of high-quality Himalayan highland wool and finest silk provides a very elegant appearance of this particular designer rug. The Tibey Lost Mamluk shows the popular Mamluk design that originates almost 700 years ago in Egypt. Characteristic of design and pattern are the geometric structures. Characteristic of this special design are the patterns in geometric structure: The main element is a central medallion, which consists of an octagon, a square and a diamond, which are put on top of each other. This interaction creates the impression of an eight-pointed star. The Lost Mamluk is a Tibey reverse, this means that in this rug the actual design lays as closed woolen line in the background, overlaid by the cut silk line. Therefore, the design has got a very discreet appearance – the famous Mamluk design shows only slightly irregular through the light blue silk line. A while ago, we have presented a Mamluk designer rug form an other collection – please have a look at our rug of the month September 2014. Despite its ancient design, the Tibey Lost Mamluk presents itself very modern due to its reduced, very decorative colors. Thanks to the irregular overlap of the silk line, the design disappears in the background – that is the reason for the design name "Lost Mamluk". The soft colour gradients and the discreet vintage look, resulting from the loop and cut structure, provide a changing appearance of this decorative rug, which actually depends on the angle of view. All rugs of the Mischioff Tibey Collection – as well as the Lost Mamluk – consist of excellent Himalayan highland wool and finest silk. We produce the rugs in Nepal under fair conditions - inspected and certified by the independent Fair-Trade Label STEP. Fair wages and the environmental friendly production of all our collections rugs is a matter of course for us. With its approx. 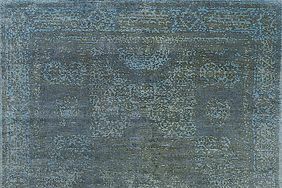 160.000 knots per square metre, the rug of the month January 2016 carefully knotted. The overhead silk lines provide a very gentle and shiny pile, almost like rug made of 100% silk. The rugs with this exciting structure are available in our standard size of 300 x 230 centimeters (pile height: about 6 - 8 mm) as well as orderable in desired custom sizes. The production time of individual custom orders will be approximately four months. We gladly provide you with additional information about our rug of the month January 2016 or about other rugs of our diverse collections. Please contact us for your questions - we look forward to your inquiry! Private customers can use our Where-To-Buy Search to find a local distributor. We will gladly help you to find an appropriate store in your area.